I was keen to get the car roadworthy as soon as possible in order to drive it up to Nuneaton to have the hood put on. The difficulty at the moment is booking it in for work as it needs to coincide with dry weather! Fortunately the day of the MOT was a fine sunny day enabling it to be dropped off as soon as the garage opened. 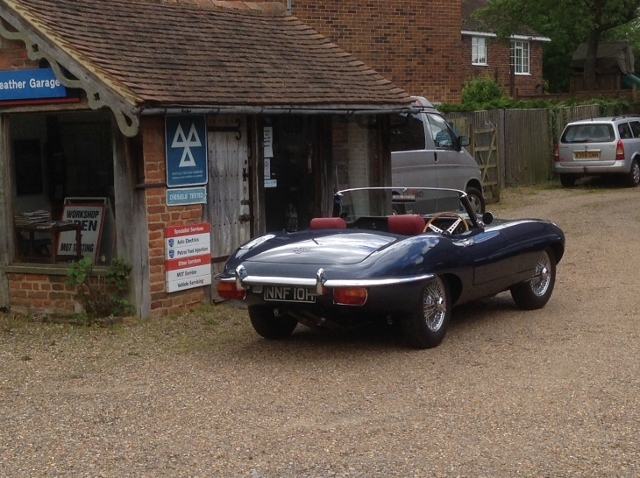 It had been booked into a local Jaguar specialist the following day to have the suspension geometry set up. There was a chance, with a following wind, that it might be road legal by the weekend! After a few anxious phone calls during the day, it became clear that they wouldn’t have time to complete the MOT. They hadn’t even had time to get to the bottom of the front carb running far too lean. The car was returned to base and a second MOT appointment made for the weekend. I decided not to cancel the wheel alignment the following day, planning a quiet route for the 2 mile journey that was not frequented by the Rozzers. Alas the car only made it about ¼ mile before conking out. After all the years of effort, it was a particularly low moment. I was certain it was due to fuel starvation and that wretched air lock. Luckily it was possible to get the car back in 100 yard stints, by waiting a few minutes between each spluttering halt. The second MOT was essentially a repeat of the first with no progress made and the car returned yet again, without any work done either on the tuning or MOT. I took the opportunity to take the front carb off to look into why it was causing the front two cylinders to run too lean. The jet was properly centred but the float lever arm was found to be 3/16” off resting on the specified standard, a 7/16” rod. A few days later it was back for the third attempt. The revised plan was to leave the carb tuning as historic vehicles aren’t subject to MOT emissions testing and just do the MOT checks. As they say, third time lucky …. this time it proved to be just that! It had passed the MOT and was ‘road legal’ … the first time in over 20 years! Although it had taken three trips to achieve, I’m considering it as passing first time! However there were obviously issues to address before it could be considered truly roadworthy. In fact, the MOT brake test has to be done out on the road due to the limited slip diff. They only just managed to perform the test and get it back to the garage before the fuel starvation ground them to a halt! It was time to get some advice from my fellow trusted petrolists who had put in the IRS and come up with a plan. My worry was that it was the pipe running under that car that was a fault. Renewing it would require the IRS to be dropped and all that entailed – something I really wanted to avoid! Their suggestion was to replicate the pipe run off the car using some flexible hose of the same bore. This would provide a more accurate flow rate that one could expect to achieve. If it is significantly different from the output of the under floor pipe, then it would point to this section being the root cause. There were no kinks or collapsed bends in the pipe. The only other explanation was a blockage of some sort, but it’s a single length of (brand new) pipe which is open at one end and terminated at the other with a soldered connector that just mates with the bulkhead union. Hmmmmm …. could the soldered joint be causing a restriction and hence the reduced flow? It should be possible to poke a rod from the boot space through the union and into the pipe to get a feel to whether there was a restriction. Rather embarrassingly, all my woes were of my own making. It wasn’t an air-lock, just my dreadful soldering! I’d almost completely blocked off the pipe by applying copious amounts of solder which had flowed into the bore. Worst still, I had compounded the error by not checking my handiwork before fitting the pipe. Fabricated drill bush worked fabulously!! Further advice was sought on how best to removal it. Within no time at all, John had kindly arranged for a 3/8” BSP bolt to be machined/adapted to act as a drill bush to screw into the rear union. This would ensure the drill bit was perfectly aligned with the centre of the pipe and I would not be making matters worse by damaging the pipe itself! The flexible hosing that had been used find out the expected flow rate was rigged up to pass fuel back up the wrong way to blow out any swarf. The same flow rate test was repeated with the re-bored pipe. A flow rate of 1.5 litres was achieved with the flexible pipe and surprisingly an even higher rate of 1.75 litres per minute is now flowing in the pipe. Compare that to the 250ml before the re-bore! I’m just so happy and relieved we got to the bottom of the problem and resolved it! Not surprisingly this has cured the fuel starvation problems and the engine is running much more smoothly. Although it still needs a good tune. A couple of items were corrected as part of the MOT – even though I’d checked every suspension nut and bolt, I had still missed putting on the lock wire on the radius arm bolts. I’d also left off the jockey wheel for the water pump tensioner and the alternator fan was slightly loose. So these were corrected. Other recommendations were to ditch the original nylon style fuel pipe in the engine bay in preference for some flexible rubber hose and always carry a fire extinguisher!! The nylon pipes are very hard and I had noticed occasional leaks if they were knocked out of position. I’d rather have a traditionalist tut-tut than run the risk of a fire! Even though the suspension geometry still needs to be set up, I couldn’t resist taking it out on the road for its first real spin. It was actually the first time I’d driven an E-Type and I wasn’t disappointed!